These Modern Table Skirts that Fit Included Countertops are Ideal for Wine Tasting! The Decorative Covers and Linens are Available in a Variety of Colors! 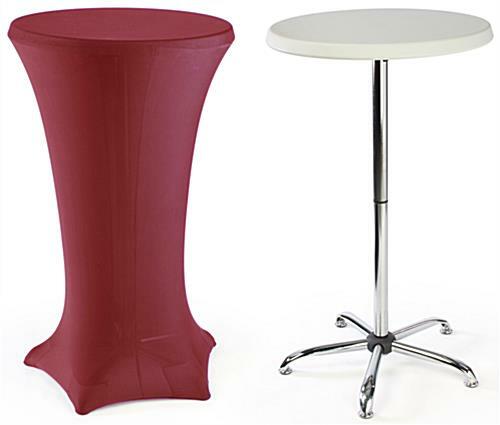 These High-Top Tables and Table Skirts Sell for Less in Our Online Warehouse! Knockdown tables are ideally meant for those traveling or with little storage room. 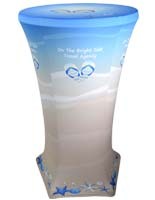 High-top design accommodates a small group of visitors during a cocktail hour or tradeshow. Wrinkle-free overlays form contemporary lines, while keeping the tables fully operational. 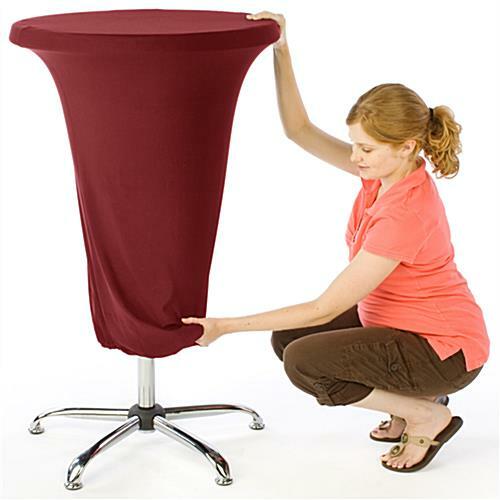 All-in-one kits take the guesswork out of shopping; Stretchy tablecloth is sure to fit perfectly. 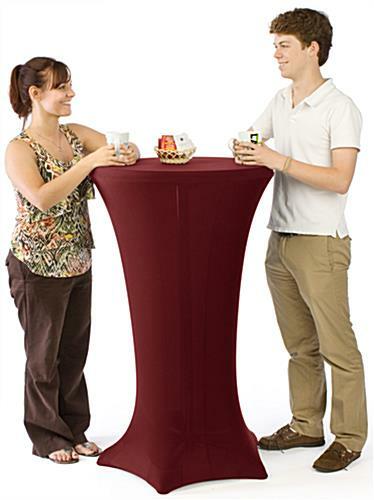 These high-top cocktail tables transform an average presentation into a more modern display with the addition of red stretching table skirts. The stretch fabric tablecloths were designed specifically for use with this round furniture, creating smooth lines that hug each edge. 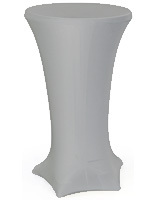 The 47" tall high-top cocktail tables, also known as pedestal highboys, do not require the use of pins or clips to attach the spandex table skirts to the mobile counters. In fact, the stretch tablecloths feature a pillowcase-like structure that simply slides overtop of the entire pedestal fixture. 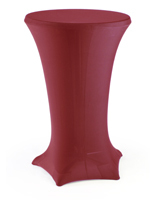 These tables and red table skirts measure 47"h and have a 27"w round counter. The furniture is a great height for use when standing. 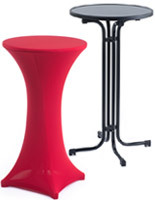 The quality tables that are equipped with red form-fitting table skirts still have a smooth countertop surface on which users can place drinks, literature, or snacks. 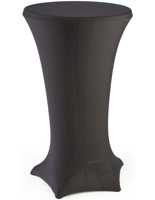 The round pedestal furniture works well in restaurants and wedding reception venues with reduced space, as the fixtures eliminate the need for bulky chairs and stools. These high-top cocktail tables that fold down for travel are made up of four separate parts: a fanned-leg base, a 2-piece steel stand, and a light gray speckled tabletop. 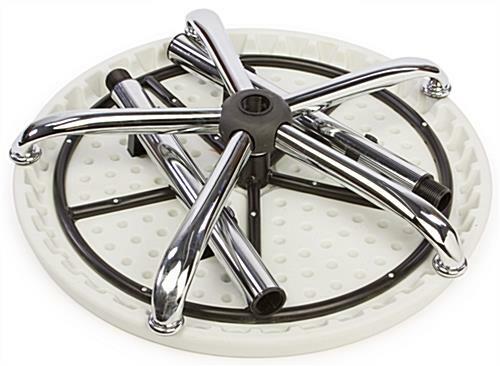 The counter is constructed from HDPE plastic, which is extremely durable and long-lasting, yet lightweight and easy to carry. 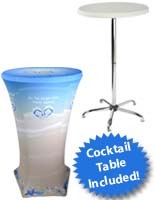 The high-top cocktail tables and table skirts that are for standing guests are shipped unassembled to save on costs, but are simple to assemble, requiring only a screwdriver. For added strength, the spandex tablecloths have five reinforced corners along the bottom for the fanned feet of the base to press against. This will prevent the stretching and tearing of the fabric. These pub tables that include table skirts can be used individually to highlight a spot within a venue or in large groups to create a uniformed presentation, which incorporates modern styling.